With the November elections right around the corner, education reform is a hot topic these days, thanks to a flood of reports indicating that the U.S. has fallen behind its peers on a number of educational fronts — from enrollment and high school graduation rates to achievement and teacher salaries. Diminishing interest (and performance) in STEM education, in particular, has prompted a billion-dollar movement to reform and improve science and tech programs in the U.S.
With STEM education reform now being touted as the key to America’s economic future, it’s easy to forget the other side. One recent national study, for example, found that only “one quarter of eighth and 12th graders are proficient in writing.” On top of that, College Board reported that reading and writing scores on the SAT hit record lows in the U.S. last year. It’s this not-so-pretty picture of humanities education in the U.S. that led Jeff Scheur, a high school English teacher in Chicago, to create NoRedInk — an adaptive learning tool that aims to help students (and you) improve their writing and grammar skills. To help get students engaged, the startup works to personalize the learning process by generating custom curricula for students based on their interests, adapting feedback, tutorials and coaching to their particular abilities and allowing them to view problem areas in color-coded heat maps. While it’s exciting to see so many bright, young entrepreneurs peeling themselves away from consumer spaces (and solving photo-sharing) to focus on solving big problems in education, NoRedInk is somewhat unusual in that it was bred from actual frustrations (of a real, live teacher) with the standard practices for teaching writing and grammar fundamentals. During his eight years as an English teacher, Scheur spent a lot of time grading papers (he estimates he graded more than 15,000). Of course, as most students past or present will admit, when handed a paper, they immediately flip through to see what grade they received. Then they probably give a cursory glance over the teacher’s comments before tossing the paper in the nearest trash can. (Just ask my professors.) This is obviously frustrating for instructors, who spend hours providing personalized feedback and pointing out run-on sentences, awkward grammar usage, messy punctuation, etc. only to watch students ignore those comments and continue repeating the same mistakes. While this is bad for education, Scheur is quick to point out that students aren’t necessarily the ones at fault. The education system focuses most of its attention on grades, rote language learning and instruction by way of red ink. What’s more, those comments and corrections can be overwhelming for students and aren’t the best way for students to figure out how they can improve their writing and grammar. And with teachers spending more time teaching to the test, they’re spending less time in class on grammar, spelling and punctuation — the foundations of good writing. 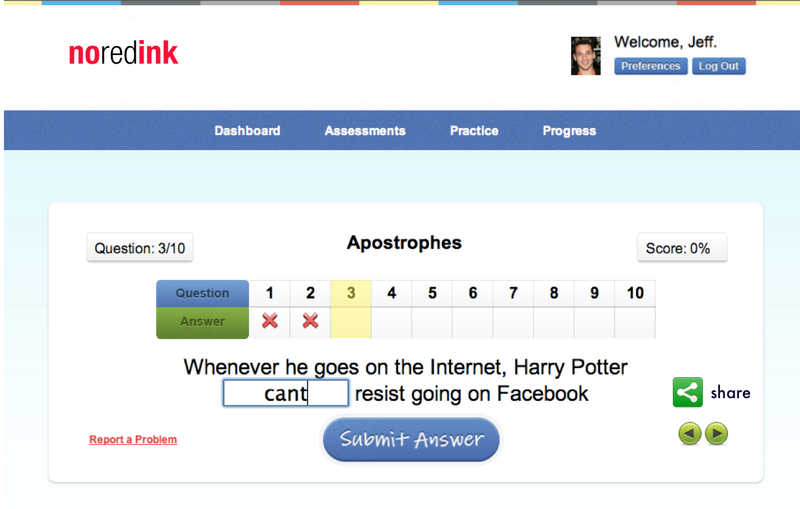 Of course, few students enjoy practicing grammar or punctuation (especially when prompted to by red ink). 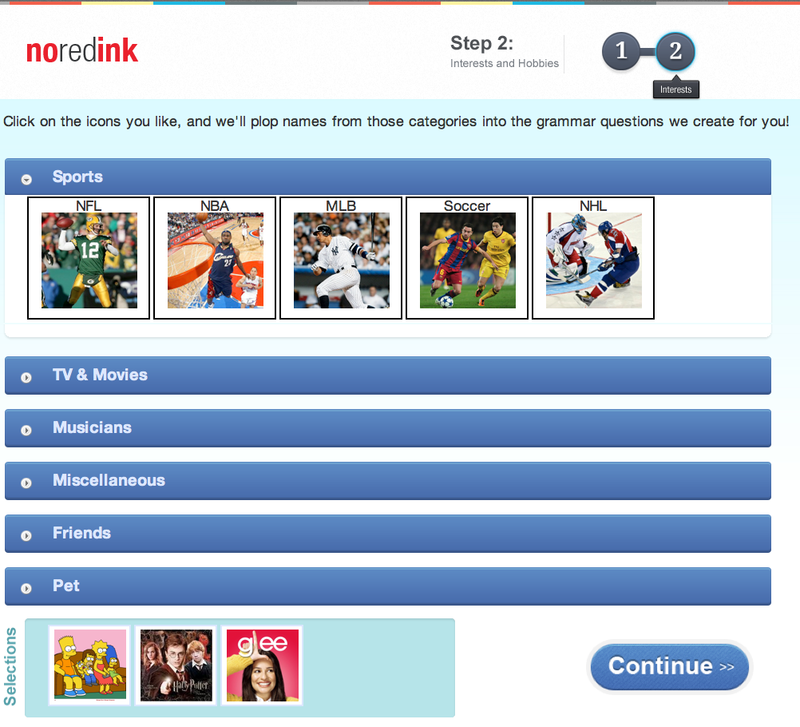 So to make the process at least slightly more palatable, NoRedInk allows teachers and students to customize quizzes and assignments with practice questions that revolve around their favorite athletes, movie stars, friends and musicians. Rather than casting a broad net, the startup’s lessons focus on what students are getting wrong, while offering them the opportunity to watch tutorials when they get stuck. NoRedInk eschews multiple choice (really, the enemy of writing), instead prompting students to input the correct answer themselves or drag-and-drop the right punctuation mark, for example. 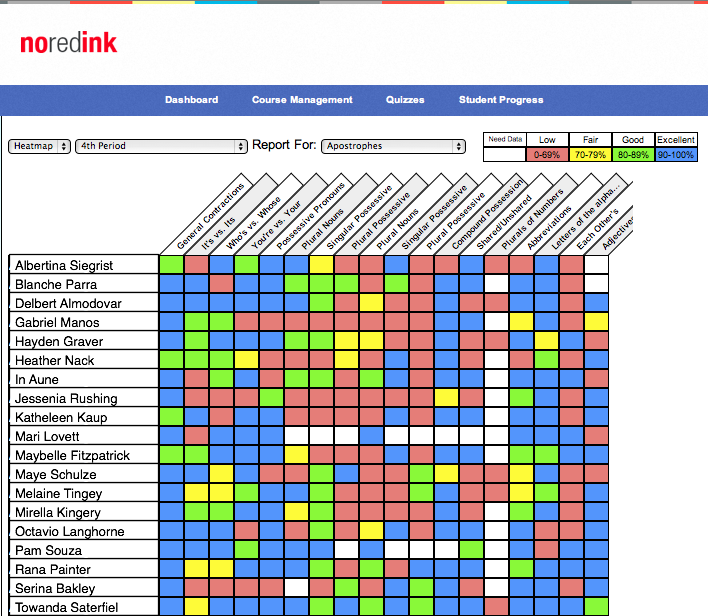 As they progress through lessons, students and teachers can track progress in NoRedInk’s dashboard, which is broken down into skill areas (and lets students view their analytics heat map-style). Because different students struggle with different aspects of language and writing (some nail commas, some don’t), tools like NoRedInk allow teachers to devote classroom instruction to what the majority of students are struggling with, using the program as a teaching aid rather than a replacement. But building the right model to make this possible is tough, Scheur says. The reason so many entrepreneurs have shied away from the language and language arts space is due in part to the fact that it requires a lot of domain expertise. It’s important to understand why students are making the mistakes in the first place. While teaching, Scheur began scanning and tracking student errors, which now inform NoRedInk’s algorithms and its learning engine. “If you haven’t graded 15,000 papers, I don’t know how you can predict trends or how students can better learn writing mechanics without relying on machine learning solutions, which doesn’t get you all the way there,” the founder said. Students learn best in their immediate social context, which is why NoRedInk allows students to define the structure, while pulling in their preferences and “likes” from Facebook et al to create personalized curricula based on that data. Today, the startup has 70,000 users and teachers and students have completed 3.5 million questions — two million of which were in the past month. Over 300 schools have applied to participate in “NoRedInk Premium,” a paid, suped-up version of the service built specifically for schools that launches this winter. As the service is free for everyone else, the premium offering represents NoRedInk’s play at creating an up-selling opportunity (and business model, really), hooking teachers and students with the basics for free and charging schools if they want to integrate the service school-wide. While social media (ahem, Twitter), SMS, chat rooms, etc. have made shorthand, abbreviations, LOLs and informal expression far more acceptable, any employer will tell you that they won’t hire people who can’t write and don’t have a firm grasp on basic grammar rules. Of course, somewhat ironically, most people (so, most of their employees) can barely manage to write three coherent sentences in a row — at least from my snobby, biased perspective. Nevertheless, while the Digital Era is changing the way we use language, it’s also (arguably) making our words and the way we use them all the more important. Think about the many public ways you express yourself on a daily basis via the written word — status updates, tweets, blog posts, etc. Right or wrong, people judge you based on your virtual identity and how you express your thoughts, which today is defined just as much by words and text as it is by your photo albums. Tools like NoRedInk provide a less painful way to boost your proficiency in grammar and writing mechanics, helping you save face — and maybe saving English language education — in the process. And, hey, the more teachers-entrepreneurs that have a hand in this, the better.